Western Swordfern growing in Bellevue, Washington 30 December 2016. 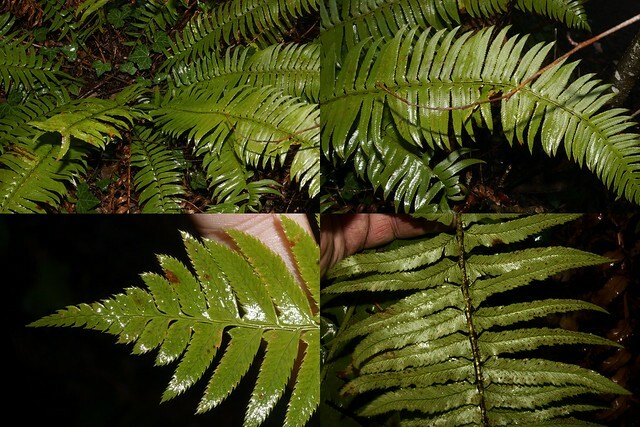 The Western Sword Fern (Polystichum munitum (Kaulf.) C. Presl) is an evergreen fern found on the west coast of North America from Southeastern Alaska to Southern California. There are isolated populations in the Black Hills in South Dakota and on Guadalupe Island off Baja California. Its favorite habitat is in the understory in conifer forests. Native Americans peeled and roasted the rhizomes for food. It is difficult to grow and cultivate in the eastern past of North America.